The Sennett and Bertha Kirk House built in 1913, is an example of Colonial Revival architecture. 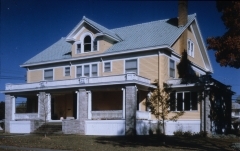 George P. Washburn designed the wood-frame, weatherboard clad residence that includes a front gabled Palladian roof dormer and side-gables with pedimented gable ends. The house is significant as a late example of the design work of Washburn. 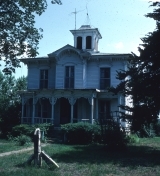 Built in 1871, the Shelley Tipton house is an Italianate two-story, wood frame structure. 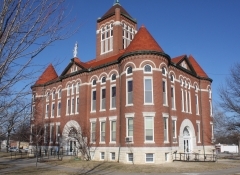 A central cupola stands on the low-hipped roof and a single story porch runs the length of the front facade. The exterior consists of wooden lap siding. Elaborate jigsaw work, scrolled brackets, and lentil moldings also ornament the building, which are definitive of Italianate style. 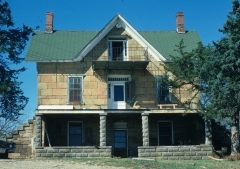 Farmer and cattle breeder Samuel S. Tipton purchased the house in 1887. Tipton is notable for his introduction of Shorthorn purebred cattle to Kansas in 1857. (See also: Tipton, Samuel S., House National Register nomination.) It was nominated for its architectural significance as an example of Italianate residential architecture. Spencers Crossing Bridge, erected in 1885 by Wrought Iron Bridge Builders, is representative of the patented Pratt truss design of 1844. The bridge consists of three pin-connected trusses spanning 230 feet with a 16-feet wide, wooden deck situated 25 feet above Pottawatomie Creek. The east and west spans known as Pratt Pony Trusses are 41 feet and 60 feet respectively; the central span, known as a Pratt Through truss, is 129 feet. Listed as part of the Metal Truss Bridges in Kansas (1861-1939) multiple property submission, the bridge is significant for its design and the impact it made on transportation.